This club chair was purchased as a Christmas present for my boyfriend's living area. He's been looking for a club chair that fits the tight corner in his loft. This ticks all the boxes, nail head trim, soft and supple dark brown leather, well stuffed seat, back leg castors for easy moving, comfortable seating that isn't too large and dominating as some club chairs can be. I highly recommend this chair. This Manchester club chair has a tufted back and traditional English caster feet. The fabric of this chair is a bicast leather in an antiqued brown color. This sturdy chair features a classic look that never goes out of style. Nailhead trim adds visual appeal, and the legs have a lovely medium maple finish that complements existing decor. The low back is curved, and the seat has thick padding for added comfort. The chair has a durable wood frame. Estimated assembly time: 2 minutes. Excellent chair for the price. Smaller aesthetically compared to a Restoration Hardware club chair, however, perfect fit for me (6' male). Excellent as an accent chair or complimentary chair to a brown leather couch in an apartment setting. Note that the front legs have small wheels which I dont really understand, small detail though. There was some delay with the delivery, I recall the processing time actually took 3-4 days as the product comes directly from Safavieh. The actual nomeclature on Safavieh's site is: COLIN LEATHER TUFTED CLUB CHAIR. I was hesitant to purchase this chair based on the reviews of this chair and those of this style but, in different fabrics, colors, etc. The main issue with others seems to be the smaller than expected size. I called and a very helpful Overstock representative had the measurements taken and indeed they were a little smaller in actuality than was listed and it was going to be corrected on site. I decided to go ahead and purchase this chair and I am so glad that I did. The quality was so much better than expected and the chair was more substantial in size than I had anticipated. 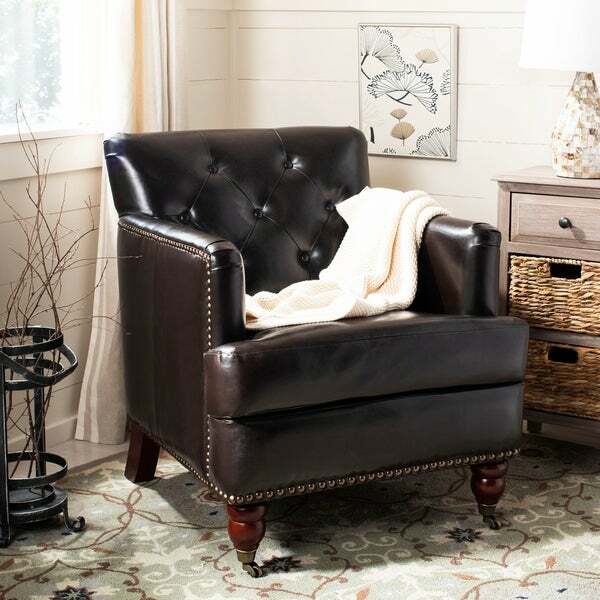 This chair is a deep rich dark brown and it is so lovely that I want to order another. The rollers on the front are great and I have wood floors and have had no problems with scratching or marking. The rollers move smoothly and only when I move the chair intentionally. I would not hesitate to recommend these great Safavieh chairs to anyone interested in purchasing one. The price is less than I have found elsewhere and the delivery was quick and well packaged. The only thing I had to do was put the legs on with the tool provided and it was quick and painless and now all I have to do now is enjoy it! We liked the chairs. They were a breeze to put together and for the price, I don't care how many times my 2 year old draws on them. They are on the small side, but if you read the descriptions carefully, you'd know that. One of the wheels on the front scratched our hardwood floors slightly, but Overstock was very kind, and sent us a couple of back legs so we can keep the chairs. Just a note, the legs are hidden under the cushion, and the opening is on the bottom of the chair. It took us a little time to figure that out since there were no directions. I love this chair and I am happy I bought it. It looks great in my bedroom. It is a nice leather that has a pretty color and gloss. The wheels on the bottom don't make the chair much easier to move but they have a great look. Simple style that blends well with other furniture and offers a masculine look with comfortable seating. This is a really easy chair to assemble. Looks great! Saw the same chair at Target.com for a lot more. It's not the most comfy chair for bigger people, but I'm small and can curl up just fine in it. Ordered another one the day I received it! Other reviews had mentioned the smaller scale to this chair and that is exactly what I was looking for. It came promptly, in good condition, and attaching the legs was very easy. It is a good looking chair and fit perfectly in my husband's small office. I am very happy. I purchased this chair to suprise my husband for fathers day and decorate his "Man Cave". It is very nice looking at comfortable. I think the back might be a little short for someone who is really tall, but we are 5'2 and 5'10 and it is comfortable for us. It is not real leather but still super soft and there isn't aren't any cracks or imperfections after a year. The chair is specified as leather, but the material used is not leather, rather the tag says " polyester". It is comfortable and looks fine, but not like leather. Like other reviews it's really small. Darling design though. It's extremely light weight and the leather is decent. Chair is a bit small, not the larger chair I thought it would be, Does sit a bit to low I feel if the legs were longer or adjustable than the chair would be of better use for my needs. It is very comfortable and sturdy and good quality. "do you have the measurements of the actual seat?" 18.9" W x 21.6" D x 18.9" H.
"How is this chair different from another on the site: http://www.overstock.com/Home-Garden/ABBYSON-LIVING-Tafton-Black-Leather-Club-Chair/9804362/product.html?recset=0d3e8cfb-794c-42d1-8d49-0d8571b996f5&refccid=GBEOP4WEIZHYWHKE24HSEPKTAA&recalg=828,512&recidx=3 ?" "The picture shows the piece in black. Is it coincident or that is the actual color because that doesn't look brown please let me know"
Hello Anna, we appreciate your inquiry. This chair is actually an espresso color (deep dark brown). Thank you for shopping with us! The scale seems right for our small office space. I like the design and the other reviews were positive. I wanted a classic brown leather living room chair that's not too big, but looks/is comfortable. Hope I made the right choice! Hello Roxanne, no, the cushion is not removable. Have a good day! "can the wheels in these chairs be removed?" Hi cluless, thank you for your inquiry! The wheels on the chair can not be removed. Hope this helps, have a great day! Hello alexisd, bicast leather is a material made with a split leather backing covered with a layer of polyurethane.